In today’s market, there are not as many manufacturers focus on making good quality earbuds as it used to be. The Japanese, which produced some of the best earbuds ever back on the 80’s and 90’s, have all given into the in-ear trend (or simply given up) and abandoned the idea of investing time and money to the shrinking earbud market. While the rise of Yuin gives hope to the niche higher end earbuds market, there isn’t a lot of decent choice in the mass producing consumer level. On the West however, the other earbud giant Sennheiser has stood firm and continues to offer worthy products to the market. With their last two generations being all fairly well received, Sennheiser introduces a new line of earbuds to the world at CES this year. Here we have a look at two of their mid end offerings in the new earbud line, the MX580 and MX581. 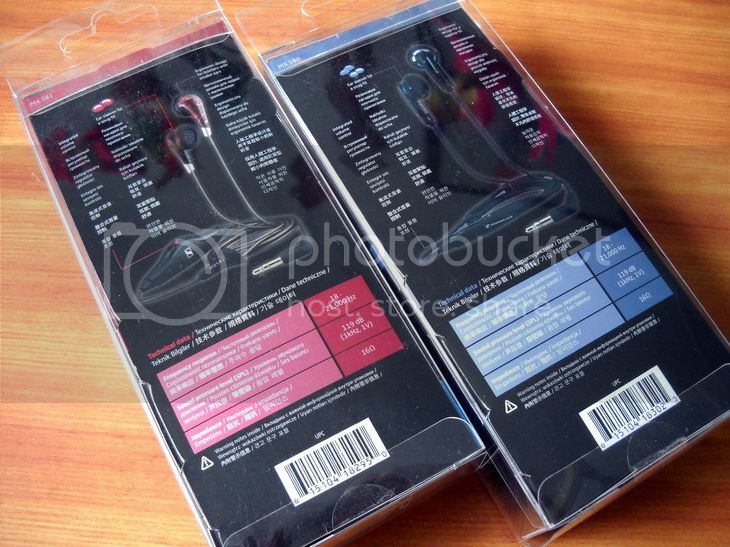 Both come in pretty standard blister pack which is fairly typical of Sennheiser lower end products. The good thing is that these packages are not heat sealed fully, but folded and sealed by a piece of sticker. Accessories are incredibly rich for such low pricing earbuds. 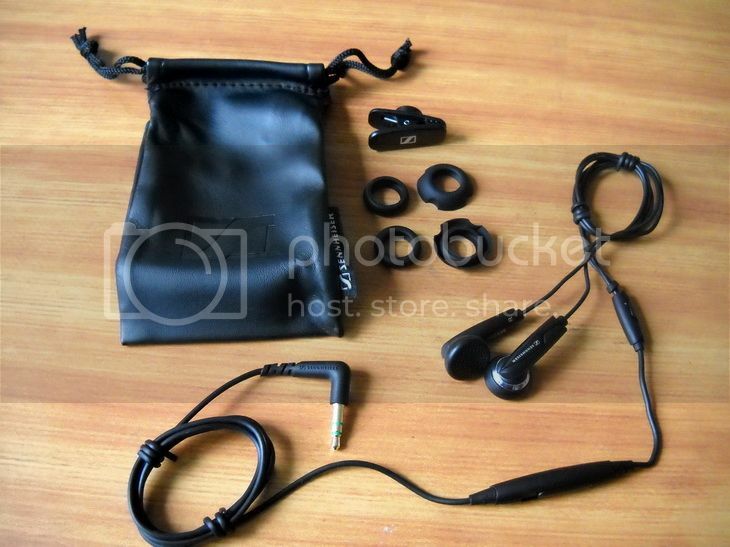 For MX580, there are three pair of sleeves (silicone ring over the transducer housing for better fit), a pair of foam pad, shirt clip and a synthetic leather pouch (which is intended for a iPod Nano 4th Gen and the earbud). 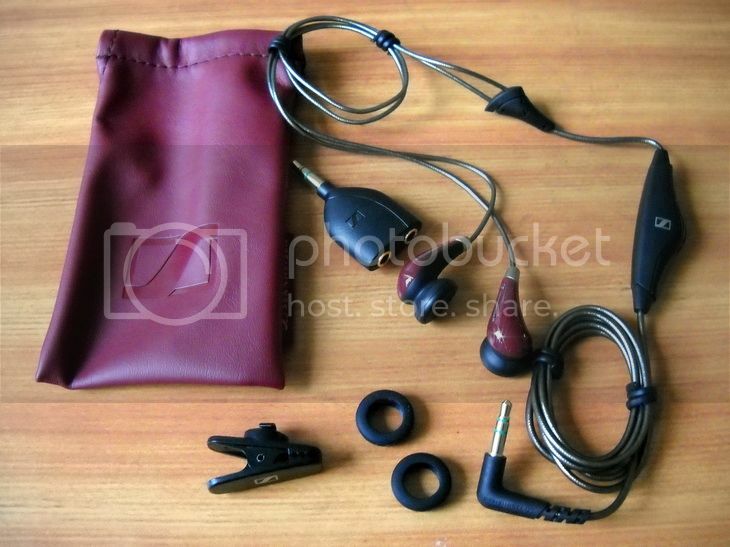 For MX581, there are two pairs of sleeves, a pair of foam pad, shirt clip, a 3.5mm share adapter, and also a synthetic leather pouch similar to MX580, but in dark red color. The 3.5mm plugs are the same on both earbuds: L-shaped, good strain relief but extended just a little too long. MX581 comes with a ‘braided-design’ cable which feels similar to those on VSONIC R04 / R02 Pro II, but with slimmer and with extra shielding inside. The cable looks and works great and doesn’t tangle much – which begs the question of why Sennheiser chose not to use this cable on MX580 as well. It really is puzzling. However, this doesn’t mean the regular black cable on MX580 is subpar. It is certainly pretty decent but just not quite as good compared to that on MX581. Both earbuds come with volume pod. The one on MX580 is a slide bar, small and doesn’t get into the way. The one on MX581 is a rotary pot, good in quality but just a little too chubby. On to the design of the earpieces, MX580 has more of a post modern look with pointy corners (bad!) while MX581 is more rounded and conventional. Unlike MX580 which is in a typical silver and black combo, MX581 also features more of a dark red and gold combo. The gold line pattern on each MX581 is different and that adds a small degree of uniqueness onto the earbud. A big outer difference between the two earbuds is the fit. A funny thing on different Sennheiser websites is how they refer to both earbuds. On the main site, MX580 and MX581 shares almost identical spec as well as most of the advertising mumbo jumbo, except for the fact that MX581 is referred as designed for ‘smaller ears’. On their U.S. site however, MX581 is referred as designed for ‘women’ (as goes for all the MX#81 earbuds in the series). Personally I can get good fit from both earbuds, but MX581 is indeed more comfortable. However the real difference is on the fact that they don’t actually sound like each other, which is a real concern as far as listening preference goes. If any female had listened to (and like) MX580, the bought the MX581 thinking she is getting the same sound, she couldn’t be more wrong as the sound signature on the two earbuds are quite opposite of each other. Both earbuds have been given around 50 hours of burn-in before the review. At first listen, I am surprised at how good both earbuds are sounding when considered they are both only US$50 @ MSRP and can be found on the street for half that. 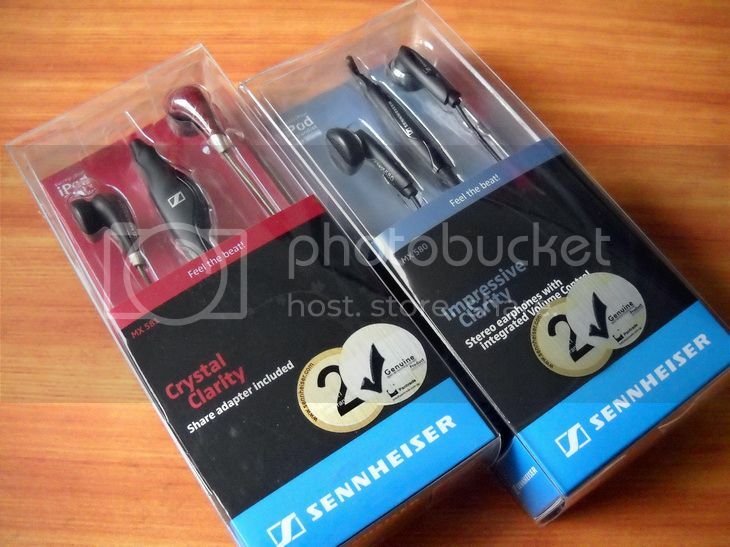 It is a good thing to know that Sennheiser’s earbuds, at least for the mid / low end models, are priced more sensibly and comparable to the competitor. Even if I have to pay the MSRP, I still won’t feel like they are a total rip off. Both earbud come with a small selection of ‘ear sleeves’ which are basically silicone ring that go over the transducer housing and make it slightly more comfortable to wear (= better fit). After trying a few on both earbuds, I picked ear sleeve on MX580 and foam pad over ear sleeve on MX581. While foam gives MX581 a little warmer without taking much away, it doesn’t work quite as well with MX580. It absorbs just a little too much treble and makes MX580 sounds dull. MX580 sounds like a tuned down version of MX760, Sennheiser previous flagship - fairly balanced and clean sounding but just a little bright. Bass has good impact and decent body. Mid is a little dry and grainy while the treble has good detail but a little harsh. In comparison, I find MX760 is just a little smoother and more refined while MX580 can sound harsh especially when the source is more revealing. One aspect that MX580 does improve from MX760 is the lack of artificial 'surround sound' effect caused by too much echo. MX580’s soundstage is more natural and pretty wide. MX581 sounds smooth, warm and more mid centric (which is good for vocal) while decent in detail. It actually sounds quite like the Sunrise AS-Feeling I reviewed just a while ago, except MX581 is slightly less dynamic, more neutral and revealing on treble while AS-Feeling is more upfront in the mid and lively. The difference however is not big enough to make one superior than the other, but merely a different in presentation. Like AS-Feeling, MX581 sound signature is overall non-intrusive. As far as SQ is concerned, I still find MX580/581 biggest rival, the PK3 wins by a very small margin. This is mainly because PK3 has less obvious weakness in the overall presentation, rather than having a noticeably ‘better sound’, so to speak. But if you were to consider the build quality and accessories, MX580/581 are certain the bigger bangs of the bucks. Personally I prefer MX581 for its smoother, sweeter vocal sound over the steelier MX580, though neither is a wrong choice – you just need to find the one that fit your taste better. Check out my Earbuds Roundup page for a simple ranking.